"Thank you Southeast Foundation for fixing our church!" Peter contacted Southeast Foundation and Crawl Space Repair about the falling insulation in his crawl space. Peter knew that the falling insulation was caused by high humidity and that high humidity was not a good thing for his home. Even though Peter and his wife already had a vapor barrier installed they where looking for a permit way to fix the home. Our crew led by Larry Eldridge encapsulated the home with our CleanSpace Encapsulation System which included a 10 mil liner, Drainage Matting, a SmartSump, and a SaniDry CX to keep the humidity at the right amount for the home. Peter and this wife are happy with the amazing out come that we did to fix their home. Penny contacted Southeast Foundation and Crawl Space Repair about the falling insulation in his crawl space. Penny knew that the falling insulation was caused by high humidity and that high humidity was not a good thing for her home. Even though she already had a vapor barrier installed they where looking for a permit way to fix the home. Our crew led by Larry Eldridge encapsulated the home with our CleanSpace Encapsulation System which included a 10 mil liner, Drainage Matting, a SmartSump, and a SaniDry CX to keep the humidity at the right amount for the home. Bob contacted Southeast Foundation & Crawl Space Repair after doing some research on vapor barriers and was interested in having one installed at his home in Havelock, NC. Southeast Foundation & Crawl Space Repair inspector Ben Daniels met with Bob and found that since he lived close to the water that he would greatly benefit from having the system installed. Jason Hines and crew installed the CleanSpace Encapsulation System that transforms a damp and dirty eyesore into a safe, healthy home. I have a crawlspace that has the following issues that need to be addressed and would like a quote/estimate: -Remove Debris and old moisture barrier and replace with new moisture barrier -Replace missing/damaged insulation and rehang any insulation that is still usable -Replace crawlspace vents -Install a crawlspace door -Wrap any underlying pipes to prevent freezing. Our crawl space flooded during hurricane Florence. We are having cracking in wall corners, puckering seams, cracks over doors, multiple areas of the house...worse on the second story. Insulation under crawlspace saturated in water due to flooding. AC ducting needs replaced as well. Approximately 2,100 square feet of area. I have 3 issues. First, we have a sagging/dropped chimney base (29" x 55") on the side of our house which needs fixing/lifting so that we can get our fireplace redone. Second, our front patio (10' x 15') has dropped about an inch or so, causing our front step to drop away from the front door. Third we have some driveway (10' x 52') cracks and we are considering either replacing it or lifting/repairing most, if not all of it. I have a 30x50 shop that the fill underneath has settled. 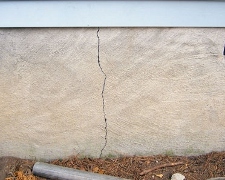 It has started cracking my concrete underneath from settling and also starting to twist my building. The slab and building are only about five years old. Half of my driveway is sinking which causes flooding. Also my walkway to the house is doing the same thing. I have moisture under the house and the insulation is dripping wet and the floors are heaving. I need an estimate. Need a professional to inspect crawlspace and to get an estimate on repairs (if needed). Brian B. Forest Hills Drive. Trina C. Forest Hill Drive. Bob A. Flanners Beach Road. James P. Naval Shores Drive. The SaniDry Sedona is the world's smallest and most effective dehumidifier on the market. 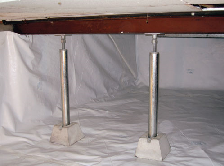 The CleanSpace Encapsulation System makes the crawl space a useful part of the home by allowing the crawl space to be transformed into additional storage. After installing the CleanSpace Encapsulation System our crew installed a custom crawl space door. Possibly high moisture levels in our crawlspace. Would like for someone to test moisture levels and inspect crawlspace then make recommendations for repairs if needed with a quote explaining everything. Crawlspace has had vapor barrier relayed 6 years ago and does have insulation installed. Need price on crawl space vapor barrier and pos. insulation replacement under house due to high moister problem ..
Water got access to the underneath part of the structure for many years. I also had termites. I believe that the foundation that this double-wide was built on is completely gone. I need a true and real estimate of the repair cost. I need it by someone with a license that can also give me everything in writing. Inspect vapor barrier and insulation and recommend and quote on repairs if needed. The middle of outside wall is bowing out. The foundation is settling which was previously repaired and seems to be settling much like it was before causing cracks to reopen in walls and, possible dampness/mold issue in crawlspace. High moisture dripping from ducts and floor joist under house.